Pop. 15,722Waterville was once home to the Abenaki people who were driven out after King William’s War (1689-97). The village was originally incorporated as part of the town of Winslow in 1771, but Waterville residents incorporated themselves in 1802 after difficulties in crossing the river to attend town meetings. Located on the Kennebec River, Waterville became a shipping center and home to numerous mills that provided the industrial base of the town’s economy. Colby College, a liberal arts college, was founded there in 1813, and was later joined by several other cultural institutions that have helped buffer the decline typical of New England mill towns in the later twentieth century. Notes: Museum staff connected with Robin King, the art teacher at George J. Mitchell Elementary School in Waterville who had 3rd grade students make maps for the exhibition. 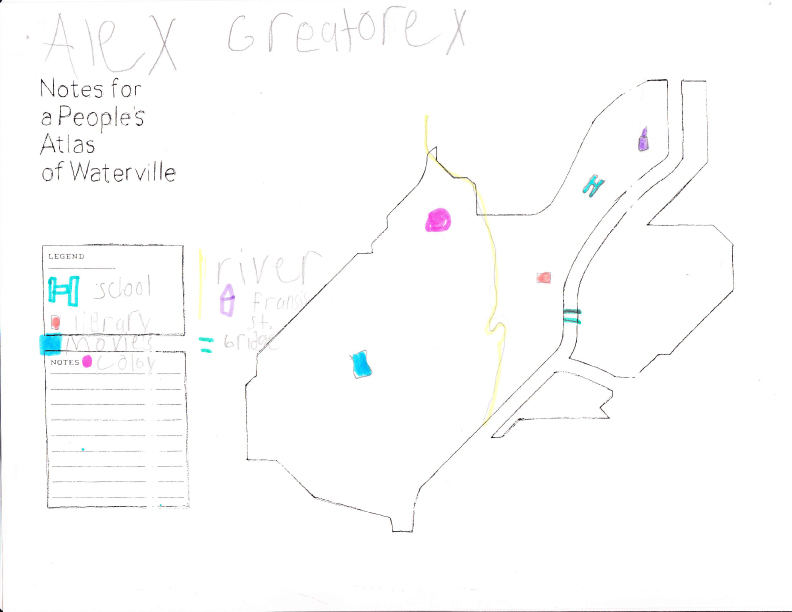 Sixteen third graders at Mount Merici, a Catholic school in Waterville, also made maps. The museum exhibited the maps in rotations of two classrooms at a time over the course of the exhibition run.